"KAN development, implementation and activities – first examples"
"Future Earth Knowledge Action Networks (KAN)"
KAN session on "Natural Assets"
organisers/speakers/moderators C. Krug, Universität Zürich, A. de Bremond, Center for Development and Environment, K. Krewenka, Hamburg University, G. Schütte, Hamburg University. KAN session on "Water-Energy-Food Nexus"
KAN session on "Finance and Economics"
KAN session on "Sustainable Consumption and Production"
Research blog post award "Global Sustainability"
"Stakeholder partnerships and initiatives: lessons learned"
What do stakeholders expect from science with regard to indicators on global responsibility? 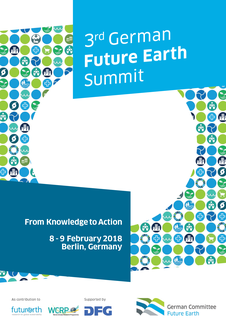 organised by J. Spangenberg, UFZ, J. Herberg, IASS Potsdam. "The way to go: sustainability in science and research"
organised by Antje Brock, FU Berlin, Katrin Daedlow, ZALF, Franziska Schünemann, IfW.